Fair Warning: In this article, I’ll be discussing various modes of disposing of a pet’s body after they pass away. If this topic upsets you, please know that this information is essential for pet owners and covers a variety of options. Disposing of a pet’s body is something no one wants to think about, but all pet owners need to know about. This is informational only; please consult with authorities in your area before disposing of, burying or cremating any animal. Disposing of a pet’s body is often easier in rural areas, where burying in the back yard may be possible. A pet’s death is always sorrowful, and the loss of our cat Peanut Butter was no exception. She died a few days after one of my last blog posts about her. You can read more on Facebook or on our Rainbow Bridge page, where I’ve posted a tribute to our sweet, sassy cat. But what blind-sided me at the time was that disposal (for lack of a better term) of a pet’s body in my town wasn’t simply a matter of digging a hole and burying my pet in our back yard. I grew up in the country. As a child, we had various pets that were simply buried on our property. Sometimes we had them cremated and scattered the ashes in our woods or on the back yard. Now I live in a suburb, and it’s not that simple. Having to deal with the complexities of disposing of our cat’s remains made a terrible day even more difficult. I’m hoping that a bit of education for other pet lovers may help them avoid the shock of discovering the many regulations that surround disposing of a pet’s remains. To find out the rules in your area, call your veterinarian or the local animal control office. They can tell you more about how to dispose of your pet’s body and the laws in your area. In many rural areas, burying a pet’s body on your own property is part of the ritual of pet ownership. Increasingly, however, some townships and counties forbid it in areas that have wild animals. Coyotes and other animals may dig up a pet’s body if it is not properly wrapped in a barrier of some sort and if not buried deep enough. The sorrow of losing a pet will be magnified exponentially by having a wild animal desecrate your pet’s remains. In most states, it is required that a pet be buried between two and six feet deep, which is quite a task. 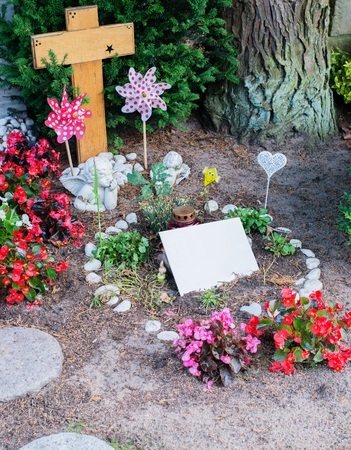 You may also have to consider the proximity of your burial spot to any water sources so that disposing of a pet’s body won’t contaminate any water sources. As animal lovers, most of us are loath to simply put out the body of our cat or dog in the trash, but in some states this is an accepted way to dispose of a pet’s body. If you can do this in your area and you are comfortable of this method of disposing of a pet’s body, contact the garbage company and ask them how to prepare the remains. You may need to seal it securely in a plastic bag, then put it into a box that is sealed shut with tape before placing it on the curb. Or call a local landfill and ask if they will accept the remains. If they do, you can drop the body off and they will dispose of it in a safe and sanitary manner. Do You Want a Memento? I often hear people say, “I wish I had a keepsake of my pet,” after they lose a pet who was a member of the family. When your pet passes away, it can be helpful to think about any memento you’d like to have. If your veterinarian will be taking care of disposing of your pet’s body, they may offer a memento such as a plaster cast of your pet’s footprint or a simple paw print. Either one of these could become a cherished memento, so do take advantage of any service that is offered. 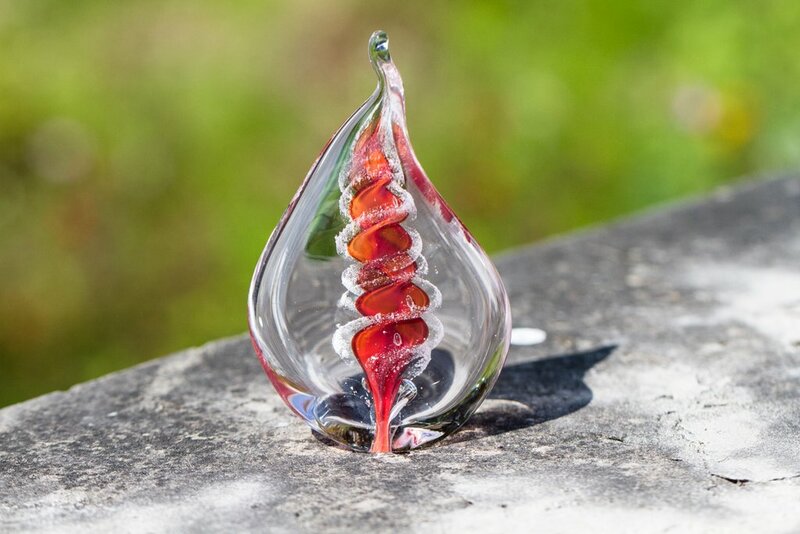 This memorial glass flame can make it easier to dispose of a pet’s body. If your pet is cremated, you can either have the crematorium bury the ashes for you (they will have a pet cemetery where they can legally do this) or return the ashes to you in either a box or a sealed urn. If you would like a smaller memento, there are companies that can use some of the ashes to create a beautiful piece of jewelry, glass art or portrait with some of the ashes. If you want to go this route, request that the remains be returned in a box that you can open so that you can send some on to the company creating your memento. You can have some of your pet’s ashes sealed inside a pendant or vial, used to create a beautiful piece of blown glass memorial art such as those at Spirit Pieces or any number of other options. However you end up disposing of a pet’s body, keep in mind that the body of your beloved cat or dog is simply an empty shell at this point. While you will want to treat it with dignity and respect, the essence of your pet has left the body. Take comfort in knowing that they have moved on and are no longer suffering or in pain. Having lost 2 of our girls just a year and a half ago this was a tough decision for us. This is definitely a topic that everyone needs to think about. Ultimately, we brought our girls home and they are with me in my office……I just couldn’t imagine them anywhere else. Jill, I understand completely about deciding to keep them with you. It can really bring you comfort. Burying is a nice option if you’re sure you’ll be living in one place, but if you move around a lot, it can be heartbreaking to leave a pet behind. A thoughtful and necessary post. We buried Weasley in your back garden in London, although I don’t believe there were any restrictions. I wish we could have brought his ashes with us. I know there is a small pet cemetary in the middle of a big London park. It is both sweet and moving to see all the little stones. Pet cemeteries are so peaceful and often quite lovely. I actually enjoy visiting them and admiring the names of the sweet pets buried there. We always buried our pets when they died when I was growing up and I never really thought there was another option until I lost my previous cat, Praline, 6 years ago. When I had to help her to the bridge, I knew I wanted to cremate her. I had no idea that the vet would send her remains out of state and I would get her remains along with other animals. I hated the idea. Luckily we have a pet crematorium within 5 miles from me where I knew I would be getting only Praline’s remains. There is a lot to consider and planning is important. We were fortunate, our vet offered the single cremation option as well as the group cremation option. They also offered group burial or individual burial. We have always cremated our pets and have their ashes. I like the idea of a keepsake. With our heart dog, we kept a little bit of his fur and also had a mold made of his paw print that we then made into a Christmas ornament. It’s so comforting to find the ornament every year when we get the decorations out. Our vet offered to make a plaster cast of our cat’s paw, which I thought was very kind of them. I remember reading about Peanut Butter. So sorry again. I’ve been through this experience twice. I personally can’t imagine just throwing my pet’s remains in the garbage though…that would never even cross my mind. I have in both cases chosen to cremate. There are so many options to keep the ashes in urns, pendants, stones, or spread at a location. 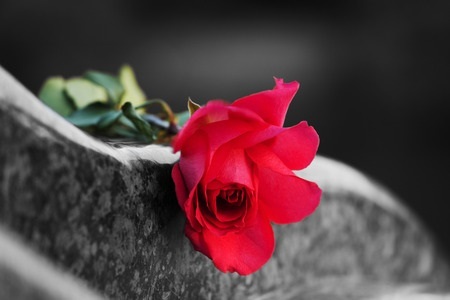 This is a very practical helpful post for bereaved pet parents. Not a pleasant subject but a necessary one to help know what to do after a pet passes. Thank you, Kamira. You’re right, there are lots of options available for storing cremated remains or transforming them to artwork, jewelry, etc. to keep them close to your heart. Pet owners should explore these options now, before they need them, so that they aren’t overwhelmed when the time comes to make a decision. There are some fantastic options out there. I love the flame! So beautiful. I still have Jasmine’s ashes; I think I really might want this one. The glass flames are beautiful, aren’t they? You can put them on display anywhere in your home as a piece of art and every time you see it you will remember Jasmine. Fortunately, I have a friend that has a cemetery on her farm. Two of my pets are buried there. As a child, we buried our pets in the backyard. Burial brings peace. I like the idea of the Spirit pieces. I saved some of Schatzi’s double coat almost every time I bathed her and plan on having it spun so that I can knit it into something beautiful to wear. What a lovely idea to keep Schatzi close to you! I had to do this last month with Chipper, my 12-year-old cocker spaniel. I had him cremated but did not ask for his ashes. I had thought hard about asking for them and burying them at my mom’s grave, since he was her dog, but decided to bury a lock of his fur the next time I visit her grave. A few years ago, I had planned to take my springer’s body home with me after she was euthanized and bury her in my yard (although I knew it was technically illegal, there are no drinking water wells nearby, so it wouldn’t contaminate anything), but the day was hot and I didn’t want to leave her body in our warm garage until the evening when we could bury her. So at the last minute, I decided to have my vet cremate her. It’s a hard decision to make. There are so many options, and weather makes a difference. It’s difficult to bury a pet when the ground is frozen and the temperature is well below freezing. Sometimes tough decisions have to be made.